Although the most common maracas are those of Puerto Rico and Cuba, the ones pictured here from Venezuela and used in joropo music. The playing technique involves up and down motions instead of the Cuban style back and forth shaking. 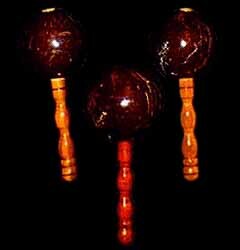 These maracas are also effective when placed in the laces of a shoe and played by tapping the foot. These were made by Maximo B. Teppa.